Hello ... Hello ... my old friends ... It's great to see you once again! 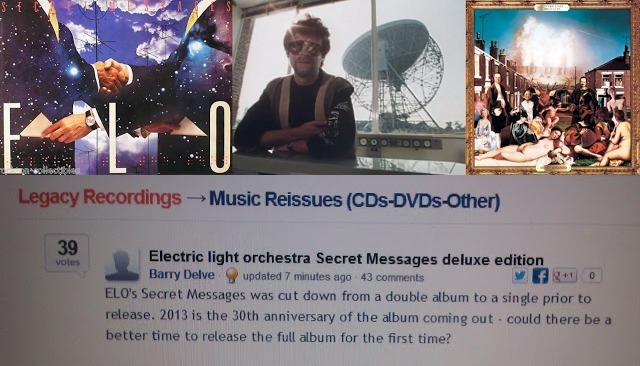 Hopefully, you are now aware that ELO Beatles Forever [ELOBF] was born in February 2009 with the original intent of campaigning for the release of the original, full 18-track version of ELO's seminal 1983 album "Secret Messages" including that long-lost gem, the enigmatic "Beatles Forever". It now appears that Sony Legacy Recordings now have an active Music Reissue web page dedicated to also campaigning for the full re-issue of "Secret Messages" - complete with all original eighteen  tracks including, of course, "Beatles Forever". This is a golden opportunity to help make a 30th Anniversary Deluxe Edition of "Secret Messages" a reality in 2013! Please consider visiting the above web page and casting a vote for this exciting possibility by clicking on the above link. Good luck and West Bishes! Yes make it happen the way it was intended. Enough of these compilations with unreleased tracks.